This afternoon, my one month vegan challenge was accepted by Scott Andersen, the guy who originally taught me how to cook some of my favorite vegetarian and vegan dishes. When suggesting this challenge to many of my friends and acquaintances, some laughed it off saying they “love meat too much,” while others said it sounded like a good idea but they just weren’t up for it. I consider veganism, which I practiced for 10 years before I got married and became an ovo-lacto vegetarian, to be a 100% positive thing, and not any kind of sacrifice at all. I look at it as the way to do something right in a world that does this thing, eating, mostly wrong. Instead of depriving myself of something, I think of it as giving myself something, the most nutritious foods possible. I won’t kid you into thinking all vegan diets are healthy, since they can include as much fat, simple sugars and calories as any diet can, but when done well, which I know how to do, a vegan diet change turn your health around, and I know we can all be healthier. If you are giving it any consideration at all, now might be a great time to give it a try: September 11 through October 11, 2014. It’s on! Read Scott’s thoughts on this here. 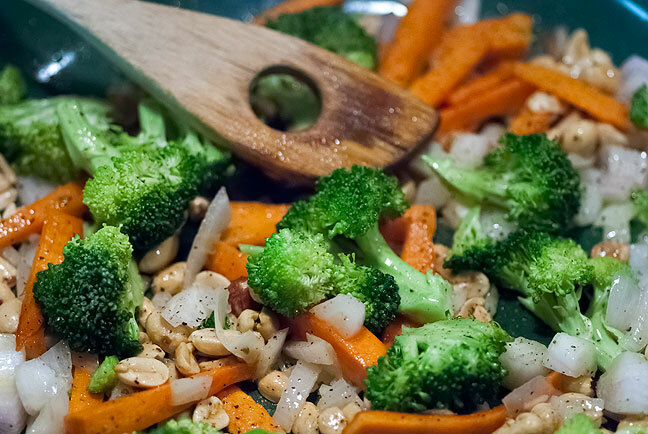 Dinner tonight was my top go-to vegan entrée, broccoli stir-fry with carrots, onions, and dry roasted peanuts, seasoned with fresh ground black pepper and just a splash of Pearl River Bridge soy sauce. I feel a food log is not warranted, since breaking the challenge only harms myself, and I know I won’t.